Gum (periodontal) disease is the leading cause of tooth loss in adults. About three out of four adults have some form and are unaware of it. Regrettably, even when someone knows he or she has it, putting off going to the dentist can be the first response because of treatment anxiety. Then the problem worsens. Fortunately, Dr. Randall Palmore is able to solve the pain and anxiety dilemma and heal simultaneously. A massive change is occurring in periodontal (gum) disease treatment. This change results in dramatic increases in the success of general practice periodontal treatment. Every guest of Dr. Palmore's is routinely examined for early detection of gum infection. If gum infection is diagnosed, therapy is initiated as soon as possible non-surgically in our office. While some hand instrumentation is needed, most gum therapy today is performed using ultrasonics and supplemented by anti-microbial therapy. Moreover, Dr. Palmore is certified to perform laser periodontal therapy for particular areas of concern. Although surgery is always an option, it is not the first choice for treatment of gum disease. Dr. Palmore and our hygienists have the technology and skills to stop the progression of the gum disease comfortably and quickly. Rather than putting off treatment, start enjoying life! Do you suffer with bad breath? Are your teeth shifting or loose? Have you noticed that your teeth "look" longer? The TERM root canal (RC) might continue to live on, but the antiquated treatment it was equated with has been eliminated. While every dentist does not use this level of therapy, Dr. Palmore is prepared to change your views on RC. He can save your tooth and stop the pain. By saving your tooth, you also protect the bone, which holds the tooth root. "I can't believe I waited this long!" We hear this refrain from patients who have experienced this advanced method of RC therapy. When a tooth is cracked or becomes infected and the nerve is damaged, pain is inevitable. It often takes four appointments or more to do this laborious work with hand instruments. Many dentists also need you to travel to a specialist. Within this comfortable, advanced facility, Dr. Palmore performs the RC with an advanced rotary system that quickly locates problem areas, and removes the offending cause of your pain. With sonic irrigation, he gently prepares the internal structure of the tooth, and then fills and seals the tooth with advanced materials to save your tooth. There is no pulling of teeth or multiple visits that crowd your schedule, and you often save much more of the tooth than through other methods. With one appointment - about an hour and a half - you are on your way to better health. Your pain is gone, tooth salvation is complete, and your tooth is prepared for a permanent restoration. Causes: deep decay, repeated dental procedures on the tooth, blunt force trauma, which could have occurred many years ago. NOTE: injury to a tooth may cause pulp damage even if the tooth has no visible chips or cracks. Root/nerve damage left untreated can cause pain or lead to an abscess. Porcelain veneers are an amazing advancement in tooth transformation. It is hard to believe such a thin-wafer of porcelain can have the qualities it does. Some might think the only thing dental veneers do is straighten teeth and make smiles beautiful. While the natural beauty fact is undeniable, veneers have other superior traits. Dr. Palmore can artistically transform crooked teeth and achieve balance and symmetry that is stunning in its result. Plus the porcelain veneer can be used to restore teeth that have been damaged and provide a very strong, natural-like bond to existing tooth structure underneath. Additionally because a veneer is so thin, tooth preparation is minimal, which helps preserve natural teeth. Prepping often requires removal of tooth structure to provide a sound surface for bonding the restoration. Prepping often requires removal of tooth structure to provide the best esthetics for the patient. 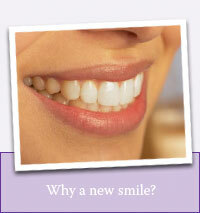 We recommend veneers when they fit your esthetic requests and health needs. Conventional orthodontics is another option to straighten teeth and sometimes the most appropriate. Dr. Palmore utilizes tooth-colored composites or porcelain onlays to create a harmonious bond and prevent unnecessary removal of healthy enamel. Mercury metal amalgams are a blunt wedge placed in the tooth and are inflexible. Metal contracts and expands so hot and cold extremes can break your tooth. Plus metal fillings hide disease even from x-rays. Finally, they cast unflattering shadows because of their dark, grey tint. Composite fillings and porcelain onlays look, feel, and perform much more like natural teeth. These porcelain restorations eliminate disease concealment, and hold their shape. Because the restorations are bonded in place the remaining natural tooth structure is also strengthened protecting the tooth from "unnatural" fractures. Are there dark lines around the edges of your old crowns? Today there is a better choice. Dr. Palmore provides porcelain or Captek, which eliminates the dark metal showing through near the gum line. Healthy dentistry now also means healthy looking! Dr. Palmore is highly trained and certified in laser treatment. The soft tissue laser he uses is painless and this surgical method causes no scarring or bleeding. The laser makes it possible to comfortably change the look of your smile. Smiles with excessive gum tissue can make teeth look shorter and conceal your beautiful teeth. While a certain level of coverage is healthy, extra gum tissue provides no additional benefits. Dr. Palmore can artistically contour your gum line to uncover the complete potential of your smile while ensuring the health you demand. Smile whitening is one of the simplest ways to change your attitude in a very positive way! Our methods are gentle, safe and very effective on some of the deepest stains. With professional guidance from Dr. Palmore's team, you can achieve a level of whitening where over-the-counter methods fail. We can help you get your smile healthy and in professional-looking shape, reversing the discoloration of tooth enamel. Determining whether you are a candidate for whitening is largely based upon diagnosing the exact cause of the tooth discoloration. Careful clinical examination and X-rays will help determine if whitening is indicated for the strength and condition of your teeth. Whitening is done simply in the comfort of your own home. It starts with an initial appointment at our office to determine if disease is present. Then impressions are taken and custom trays are made to fit snugly around your teeth. This custom fit allows us to deliver the highest level of whitening solution available to each tooth evenly. When trays are picked up a couple days later, we show you how the whitening trays work. Each night after thoroughly brushing your teeth, you insert a small amount of gel into the trays and place them on your teeth. As you sleep, the whitening occurs. You remove the trays in the morning, clean them carefully, and brush teeth normally. You do this until your desired result is achieved. We use Zoom whitening materials in our office because they are continually improving their products. Most recently, they have produced new gel formulations. One allows daytime whitening at a quicker pace while another is specifically designed for those with sensitive teeth. Zoom, made by Discuss Dental, also makes the whitening products used on the Extreme Makeover television show.